18. Issue of certificates in respect of Kandyan marriages. 19. Special licences for issue of marriage notice. 20. Objections to issue of marriage notice certificates. 21. Inquiries into objections to issue of marriage notice certificates. 22. Solemnisation of Kandyan marriages. 23A. Issue of copy of marriage registration entry free. 24. What constitutes solemnisation and registration of Kandyan marriages in authorised places and between authorised hours. 25. Transmission of duplicates of entries made by Registrars. 26. Replacement of original or duplicate marriage registration entry in certain circumstances. 27. Consequences of delay in solemnisation and registration of Kandyan marriages. 28. Registration to constitute best evidence of marriage. 29. Proof of certain matters not required once Kandy an marriage is registered. 30. Mode of rectifying failures to register, and errors in registration of Kandyan marriages. 31. Issue of marriage notice certificates and solemnisation and registration of Kandyan marriages upon alteration of divisions. 35. Special provisions relating to orders for the dissolution of Kandyan marriages. 36. Registration best evidence of divorce. 40. Division of Kandyan provinces into divisions. 41. Appointment of Registrars of Kandyan Marriages. 42. Powers and duties of officers. 43. Residence, office and additional offices of Divisional Registrars. 44. Attendance of Divisional Registrar at office. 45. Books to be kept by Registrars. 46. Publication of lists or Divisional Registrars and their offices. 48. Production of books for inspection. 50. Surrender of records by Registrar on his ceasing to hold office. 51. Correction of clerical errors in registers. 53. Powers in relation to inquiries. 56. Certified copies of books. 62. Undue solemnisation of marriages. 65. Offences triable by Magistrate's Court. 67. Registers, regulations made under Marriage Ordinance. 68. Special provisions applicable to certain marriages. 69. Application of Part IV to certain marriages. 70. Kandyan Succession Ordinance not to apply to marriages under this Act. (b) any such marriage which is not so solemnised and registered shall be invalid. (b) both parties thereto are under the lawful age of marriage. (b) if a child is born of the marriage before the party aforesaid has attained the lawful age of marriage. (b) if a child is born of the marriage before both or either of them have attained the lawful age of marriage. (c) if the male party thereto is the brother of the female party thereto either by the full or the half-blood, or the son of her brother or of her sister by the full or the half-blood, or a descendant from either of them, or the son of her husband by another mother, or her deceased daughter's or granddaughter's or mother's or grandmother's husband. (b) if the other party to such prior marriage is still living, unless such prior marriage has been lawfully dissolved or declared void. 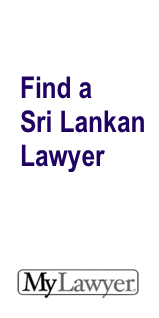 (ii) the guardian or guardians so appointed is or are dead, or is or are under any legal incapacity, or is or are unable to give or refuse consent by reason of absence from Sri Lanka, the District Registrar for the district in which the minor resides. (f) shall be signed by the applicant. (b) shall call upon the person to whom the notice is addressed to appear before the Registrar along with his witnesses, if any, on the date and at the time and place so indicated. ( Before disposing of the application the District Registrar shall give the applicant and, if the applicant is merely a person interested in the marriage of the minor, the minor and their respective witnesses, if any, an opportunity of being heard. (g) shall be signed by the appellant. (e) shall be signed by that party. (d) that the consent of any person thereto is required by this Act and that such consent has been obtained or that the consent of any person thereto is not required by this Act. ( The witnesses to the declaration shall be persons who are personally known to the party and, if the party is not known to the Registrar, to the Registrar, The name in full, occupation or calling and place of residence of each witness shall be entered at the foot of the declaration. (c) that the declaration was made and subscribed by the party in the presence of the Registrar. (a) The Registrar shall file such notice and keep it with the records of his office. (b) The Registrar shall enter in his "Marriage Notice Register such of the particulars specified in the notice as may be prescribed (hereinafter referred to as the "marriage notice entry”). (c) The Registrar shall publish the notice by exhibiting or causing to be exhibited a true copy of the notice or of a prescribed extract thereof at some conspicuous place in his office for a continuous period of at least twelve days reckoned from the date of the marriage notice entry.